Hi, I’m Tchad Elliott. Welcome to my sewing and design classes in Chicago blog. I started this version of the blog back in 2009-2010 after having run sewing and design classes in Chicago in some form since 2004. Everybody coming up here then was pushing me to get my workrooms a little more publicity and it seemed like a good idea. I had NO IDEA at the time that it would turn out to be a thing like it has, so I wrote on-and-off taking breaks here and there as life came at me. In February-March of 2018, after having taken a 5 year break from writing about the goings-on up here, I decided to pick it back up. I saw the buildup of pictures, events, and people in my iPhoto’s storage and thought “well, why not?” and here we are. I don’t generally talk about myself directly on the blog – it is about other people and what they are doing for the most part – I prefer to let my personality and general sense of the world come out in the writing about their things rather than hit all of the world over the head with a hammer about fashion, fashion, fashion, or me, me, me. So many times things like this are just bloated vehicles for someone’s ego. This may very well indeed be that, but I’ve found over the years that helping people get where they need (or want) to be gives me a better sense of self and makes me feel better about the world generally than telling them over and over what I’ve done. Much better to ask “What have you done? What do you think? Where do you want to go?” So if you are reading this or looking at the classes Instagram, the Twitter for classes, or the classes Facebook page, don’t expect tons of selfies or daily updates about my eating habits, sketches, or musings. You’ll get it in classes or looking at my other more personal things online, but that’s it. These classes pages are all ways to show off what other people are doing. What I do and have to offer becomes a vehicle for their sense of creativity generally and their projects specifically. Having written that, maybe it is time to open up a little bit about where I’m coming from and who I am both as a person, a sewing professional, and a teacher. I think the best way I would describe the classes I host would be to say that I try to get people expressing themselves in every sense, but starting with sewing. When you have a reference point, you can start to zero in on who you are. 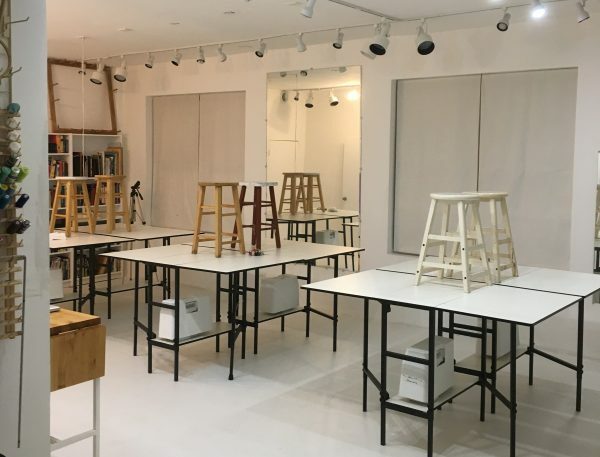 These spaces of mine host adults who want to learn the technical skills necessary to learn how to fit and drape themselves to various degrees and then take their creations out into the world. No, still too much and yet not enough at the same time. I built out this space in 2006-2010 myself without investors or outside funding to sew and teach other people how to sew at their own pace. I don’t have syllabi, I don’t have set projects, and I don’t privilege or enforce any specific method or technique over another. I want this to be a space where people learn through their mistakes and celebrate themselves for their victories. That’s a little better. I may end up rewriting this, but there you are. These classes are not about my work in design, nor are they about selling you anything other than the class itself. I am not affiliated with any company or manufacturer, so any recommendation I make or tool I use is based on my own experience with it. I am not here to sell you fabric, sewing machines, notions, or anything other than skills. When you see a link on this blog or anywhere else I write, it isn’t appended with a business tool for me to get a percentage. When I send out a PDF introduction that has links to various projects and patterns, they are just that – links to projects and patterns. When I tell you that I love a Bernina Classic for this or a Brother cs6000i for that, it is because I do. They aren’t paying me for that. You are the ones paying me with your attention and class fees; that is enough. I am invested in teaching you how to sew and think about the world of sewing. I think this is an important distinction to make. Our world is cluttered up with all kinds of marketing and schemes. Sometimes they are helpful, sometimes not. I err on the side of less marketing and do my thing up here without worrying about all of it (or much of it). Hopefully you guys benefit from that. I was born in 1974 on a derelict farm to very young pioneer-spirited parents in the Ohio River Valley – part of what some have called “Greater Appalachia” in Southern Indiana at the Kentucky border. My dad built our log house and my mom was a housewife with a background in chemistry and mathematics. My first sewing experiences were with hand sewing and basic straight stitch machine work. Living so primitively, I learned how to do basic hand embroidery to help decorate the curtains she made for the house and was occasionally allowed to use the nice Pfaff 1200 that sat in my parents’ bedroom. As I grew up, Grandma would talk about the clothes she had bought or had made in the 1920s and ’30s and show me examples of them. I ended up inheriting these as well as a number of suits and shirts that Grandpa had had made or bought retail too. I spent my time listening to her and picking through the construction details myself. I began to see patterns and techniques that spanned decades in ready-to-wear and saw the various ways that the more custom pieces were put together. I began to figure out the why of sewing and construction as well as the what. Grandma was also a prolific artist, so I grew up with a solid sense of color, line, and shape. We’d spend hours going through color palettes, mixing pigments, and the finer points of painting in water colors and oils. In high school and college I made most of my own clothes and ran a small business for party and pocket money making whatever people wanted me to make when I wasn’t acting on stage. I wasn’t involved in the costume department and design yet formally, but was making a decent amount with these one-off projects. I knew tons of things already about functional sewing and how to do things by the time I was 12, but this is when I started to spend a LOT of time reading everything I could get my hands on. It is no good to be able to just know how to set a sleeve, you have to be able to convey that to others if you are doing it a lot. I wanted to be able to discuss it, so by 16 or 17 I had memorized everything I could get my hands on from any sewing or design manual that crossed my path – everything from Vogue’s old encyclopedic standby to 19th century tailor’s manuals, from academic texts about fabric composition and construction to older textbooks from the Department of Agriculture. I devoured it all and tried to memorize and use it fluently. As my eye turned toward design formally, I used up electives in college and begged my way into costume and fashion design and construction classes that weren’t part of my college majors. My college major was International Studies with a focus on post-colonial politics and French. I’ve always tried to keep things interesting by having interests in multiple disciplines. After a brief stint abroad, I came back to the United States and was casting about for something to do. In my hometown, it is easy to end up as someone who is overeducated and managing a Burger King at 50 thinking: “Where did my life go? This isn’t what I wanted for myself!” and so at 22 I sold everything, packed my bags, and moved to Chicago. I came to Chicago with a job at Jo-Ann fabrics corporate and started trying to figure things out. I didn’t love the job I came to Chicago for and I didn’t see an immediate use for my college education. But I could sew and design, so I started teaching on a contract basis for Viking sewing machines and working from my small studio in Ravenswood on the North side. That tiny studio produced everything from dresses to drapes, from prototypes for yoga slings to huge softline promotions for cigarette brands. When you are young and hungry, you take it all. I took it all – including a particularly interesting project that involved outfitting a tantric yoga studio’s uniforms. The variety was exhausting, but never boring. While I was taking on every project I could, I began thinking about where I wanted to be. Throughout your 20s, you tend to listen to other people talk about what they want and what they’ve done and then incorporate that into your own ambitions. I knew what I could do, I knew what I was capable of, and so my understanding was that I should want to open a boutique or have fashion shows one after the other. I’ve never been in love with the idea of running a boutique or manufacturing clothing for retail, so I experimented with different fashion show formats – runway shows, small and intimate art-gallery trunk shows, personal concierge shows in client’s homes… you name it. None of this felt quite right for me. I was being told what I should want, but wasn’t listening to myself about it. I built the workroom myself over the course of 2004-2009 with the idea that it could be a beautiful, clean, and organized place to sew and design, but opened it in the back of an old commercial building so that my work wasn’t interrupted by foot traffic. 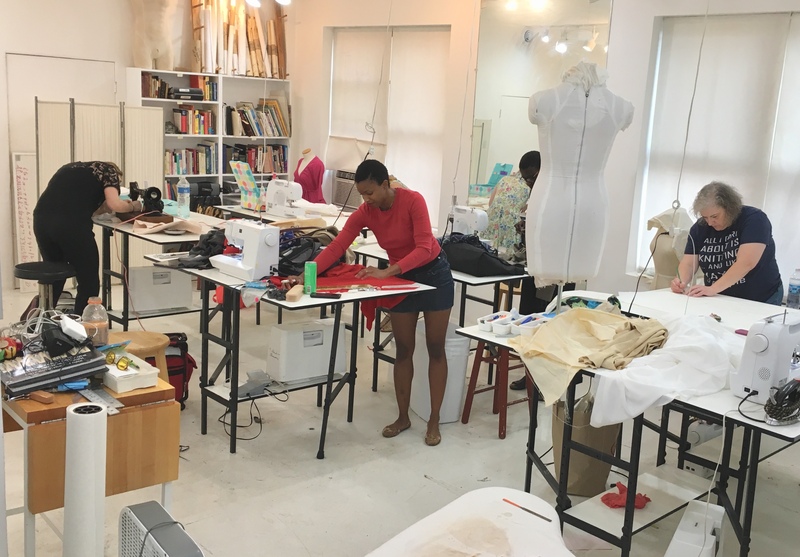 As it is, this was a good decision because it also means that people seem to be charmed that there is this secret private haven for sewing and design in Uptown tucked away. I get to spend every day in my “Bat-Cave, but for sewing” or am the daily member of the “Secret Sewing Society”. Whatever you want to call it, I’m proud to have built it and lucky to have it. As I moved through the 2000s it became clear to me that I was interested in teaching sewing classes and taking on small independent design projects on an individual basis more than anything else. When you get clarity like this, things seem to really start taking shape. Since 2010, this has been my ideal practice. I teach people how to sew, design, and think about sewing and design while working on individual client projects or non-sewing-related pet projects the rest of the time. This blog is about the classes I host, but you can just as well find me off-class-time teaching obscure antique German penmanship, getting the details right on a black silk gown, working out the finer points of a historical restoration project at my architect’s drafting table, lecturing about rural land use and management, or involved in civil rights education. The range of things I’m interested in (and good at) is pretty broad, but my love – what I understand as my core reason for being here in Chicago – is teaching people how to express themselves with needle and thread. My 23 year old self wouldn’t understand why that is so, but he’s been gone for a while now. Quentin Crisp once said of personal style that it has to be developed in a way that it can be brought out into the world. I think that sewing and design help people do just that. If you are weaving baskets, riding horses, or painting pictures you can’t really carry your creations out to the bus stop or into the boardroom as an example of who you are as a creative person without people thinking that you are in need of a vacation (voluntary or otherwise). But with sewing and clothing design and construction, you can do just that. You can announce to the world how you are feeling and where you fit in while only giving minimal offense and/or inconvenience to the neighbors, your fellow passengers, or the boss.